This is a cold vegetable dish that aims to capture the refreshing brightness of peas and fava beans at the very tail end of their season, dressed with plenty of lemon juice and good olive oil (this dish used the Arbequina variety from California Olive Ranch). The novel aspect is juicing the pea shells to create a creamy pea shell "mousse" thickened with Ultra-Tex. 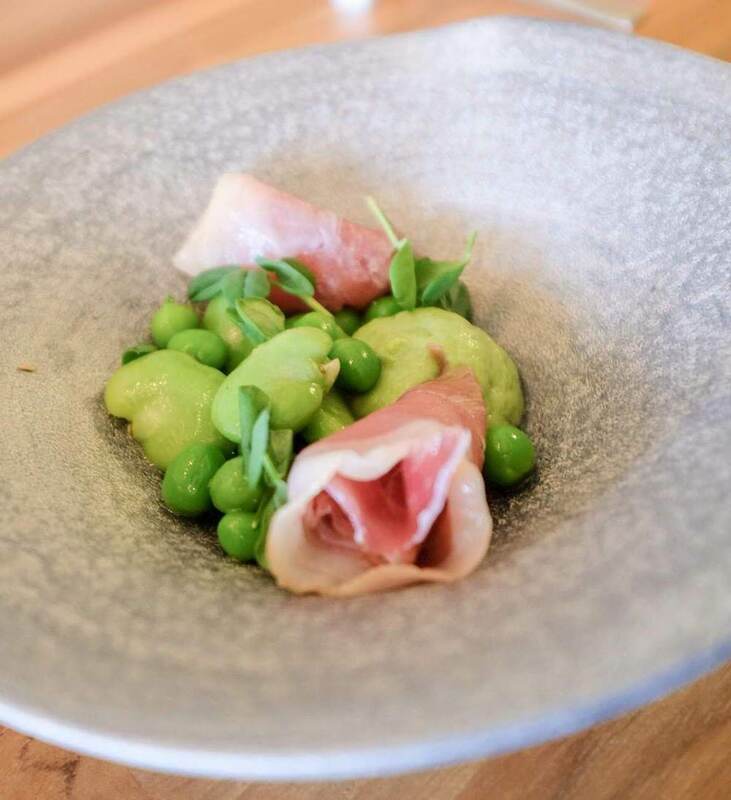 Peas and ham are natural flavor buddies, so the dish is finished with a bit of smoked prosciutto, also called speck, by La Quercia from the Fatted Calf butcher in San Francisco. Prepare the peas and fava beans (up to 8h in advance): Prepare an ice bath. Blanch the fava beans in salted water for 1m; shock in the bath. Blanch the peas in the water for 30s; shock in the bath. Drain both onto paper towels. Shuck the fava beans and split in half. Chill in an airtight container lined with a paper towel until needed. Prepare the pea shell mousse (up to 8h in advance): Juice the pea shells and reserve 60g of the juice. Blanch the frozen peas in the salted water for 2m. Shock in the ice bath. Blend with the pea shell juice, creme fraiche, and champagne vinegar. Season with salt. Weigh and set at 100%; shear in 0.2% xanthan gum and 5% Ultra-Tex 3. Transfer to a piping bag. Chill until needed. To serve: Dress the peas and fava beans with olive oil, lemon juice, and salt. Pipe some of the pea shell mousse into the bottom of a serving bowl. Spoon around the peas and fava beans. Top with some of the smoked proscutto and pea shoots and flowers.